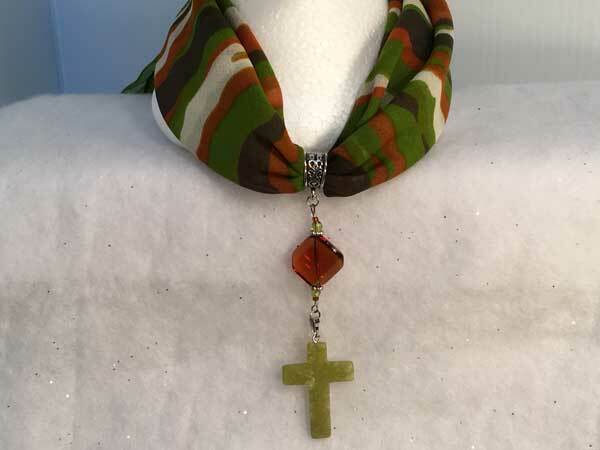 The scarf has a camouflage pattern with two shades of olive, rust and ivory. The jeweled piece hangs over 4 inches and starts with a brown curved glass in a diamond shape surrounded on both ends with silver seeds, brown seeds, chartreuse rounds and silver spacers. The lower piece is a stone cross in a perfectly coordinated shade of green. I've included over 30" of rust ribbon that can be used to hold the pendant if you want to wear the scarf and jewelry piece separately.